I bought a Mac Mini a few years ago, and it was happily running Yosemite for that time. However, up until last Friday, it spent most of its time in a box as I had no use for it. Now though I need to do serious development work using it, and decided as it's been such a long time since it had an update, I'd throw all the updates it was missing at it. This led me to installed Sierra on to it. I can't tell you how much I regret that decision so far, for the fact that connecting over WiFi to my home network is slow. And I mean painfully slow, as it quite often quotes speeds of 10Kb/s when downloading various bits and pieces from the internet. Opening Google search pages often results in about a wait of 30 seconds, followed by an even longer wait to open the page I need. YouTube videos are also painfully bad to watch, pixelated as it attempts to furnish my Mac with the video as quickly as it can at the expense of quality. Now my Mac Mini is situated downstairs in my dining room, my Billion router sits in the living room. In line of sight terms, it's about 5m to 10m with two single cinder block walls between it. Initially I thought my WiFi was playing up, however my ThinkPad running Debian 8 flies with the WiFi. I get much faster download speeds, YouTube videos load in an appropriate manner, general web browsing takes seconds rather than minutes. My iPad Air 2 (think that's what they're called?) is slightly slower than the ThinkPad but much, much quicker than the Mac Mini. All of these were tested in the same location as the Mac Mini. So I can safely rule out issues with the WiFi. So in my opinion - but I'm happy to be proved wrong! - the problem must lie with the Sierra update? I've seen numerous blog posts relating to slow WiFi with Sierra, and I have followed the steps they've outlined. Deleting preferences etc, restarting etc. But these haven't made a single bit of difference to the speed I'm getting with the Mac. So I would like to know what other options I have available to me to speed this up? I can't actually use it for the development work I need to do if the WiFi is so poor. I'm not adverse to nuking the Mac and starting again, but obviously I want to advoid this as best I can. The problem still persists. I didn't have chance to fiddle with my WiFi, although I'll be honest I'm quite annoyed that's even a suggestion by Apple as this Mac worked fine before Sierra got near it. And when I see other devices use that network without problem, well I don't know. Further more, the hard wired suggestion - yes would fix it but it's not a remedy to provide internet/networking speeds I should be getting on my Mac, but it isn't fix a problem with poor WiFi on that machine. Channel width controls how large of a ”pipe” is available to transfer data. However, larger channels are more subject to interference and more likely to interfere with other devices. A 40 MHz channel is sometimes called a wide channel, and a 20 MHz channel is a narrow channel. Use 20 MHz channels in the 2.4 GHz band. Using 40 MHz channels in the 2.4 GHz band can cause performance and reliability issues with your network, especially in the presence of other Wi-Fi networks and other 2.4 GHz devices. A 40 MHz channel might also cause interference and issues with other devices that use this band, such as Bluetooth devices, cordless phones, and neighboring Wi-Fi networks. Routers that don't support 40 MHz channels in the 2.4 GHz band do support 20 MHz channels. Channel width controls how large of a "pipe" is available to transfer data. Larger channels are more susceptible to interference, and more likely to interfere with other devices. Interference is less of an issue in the 5 GHz band than in the 2.4 GHz band. A 40 MHz channel is sometimes called a wide channel, and a 20 MHz channel is a narrow channel. For best performance and reliability, enable support for all channel widths. This allows devices to use the largest width they support, which results in optimal performance and compatibility. Not all client devices support 40 MHz channels, so don't enable 40 MHz-only mode. Devices that support only 20 MHz channels cant connect to a Wi-Fi router in 40 MHz-only mode. Similarly, don't enable 80 MHz-only mode, or only clients capable of 802.11ac will be able to connect. Routers that don't support 40 MHz or 80 MHz channels do support 20 MHz channels. When enabled, this feature allows a user to configure a list of MAC addresses for the Wi-Fi router, and restrict access to devices with addresses that are on the list. Devices with MAC addresses not on the list will fail to associate with the Wi-Fi network. MAC addresses can be changed easily, so don't rely on them to prevent unauthorized access to the network. iOS 8 and later uses a randomized MAC address when running Wi-Fi scans. The scans are conducted when a device isn't associated with a Wi-Fi network and its processor is asleep. A device’s processor goes to sleep shortly after the screen is turned off. Wi-Fi scans are run to determine if a user can connect to a preferred Wi-Fi network. Enhanced Wi-Fi scans are run when a device uses Location Services for apps that use geofencing, such as location-based reminders, that determine if the device is near a specific location. If you are going to use your Mac mini for Dev work, I (IMO) would put this on a wired connection rather than WiFi. Since the issue isn't your WiFi per se, as evidenced by the fact all your other devices work just fine; it's just Apple's implementation of it that is causing these issues (and yes, I agree, it should work as you expect it to). The best course of action would be to avoid Apple's WiFi altogether and use Ethernet (notice the emphasis). It's proven, it's reliable, and it's much faster. PowerLine Ethernet1is a technology that embeds TCP/IP traffic in the electrical signal of a home's electrical wires. The tech has actually been around since the 1970's. They are very inexpensive and quite reliable. I used a Netgear PowerLINE 1200 in a client's home in Puerto Rico where the whole house is reinforced concrete and WiFi couldn't go from upstairs to downstairs. It allowed me to add a switch and a WAP to add a server, and downstairs WiFi coverage. 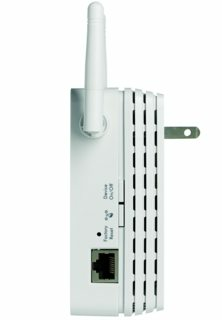 Bridged Routers or WiFi Extenders is your second option. WiFi extenders can be purchased that will not only extend your WiFi coverage, but also give you Ethernet connectivity as well (make sure they have an ethernet port like the picture below). Since your WiFi is good, this will allow you to use your good WiFi signal and bridge it to the more reliable Ethernet on your Mac mini. You don't even have to purchase this if you have a cheap router laying around that supports DDWRT2. Not the answer you're looking for? Browse other questions tagged macos wifi sierra mac-mini .